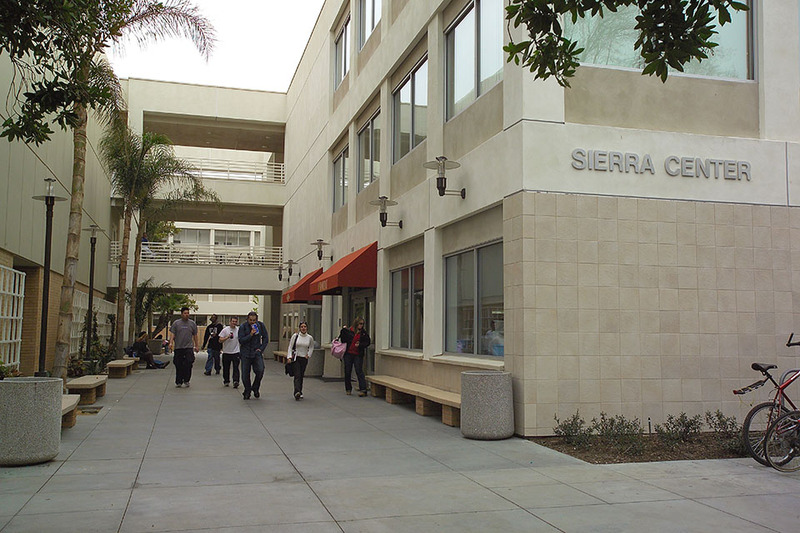 The Sierra Center at California State University, Northridge. Photo by Lee Choo. 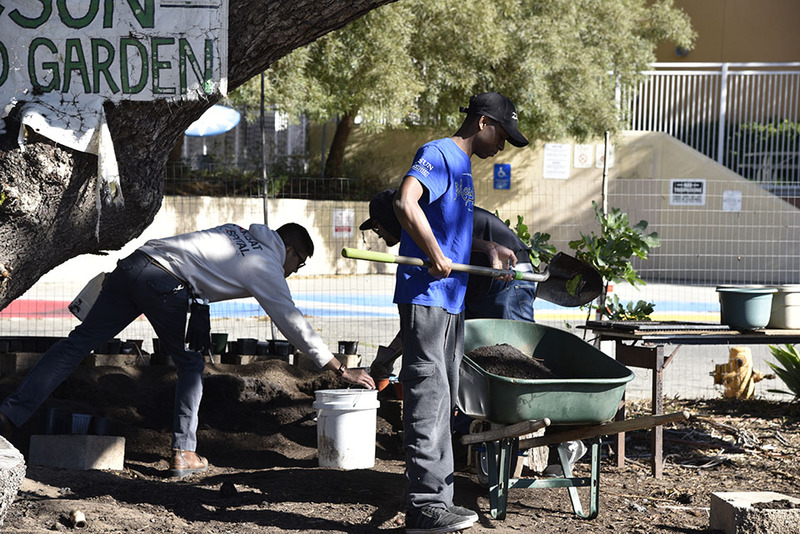 Students work at the CSUN food garden, where pre-consumer food waste is composted. Photo by Joy Hillman. The compost pile in the CSUN food garden. Photo by Joy Hillman. The 2014 California State University Sustainability Policy set the goal for reduction of landfill waste produced on each of the 23 CSU campuses to be decreased by 80 percent by 2020. The long-term goal is to turn campuses into zero-waste facilities, which means that 90 to 95 percent of the material leaving the campus can be recycled or reused. California State University, Northridge is actively working to reach that goal. The current focus is on the transformation of the Sierra Center into a zero-waste facility. Waste reduction efforts at the Sierra Center began with the on-site dining facilities’ composting of coffee grounds and eggshells, said Tim Killops, associate director for Facilities and Operations at The University Corporation. “Now, everything that comes out of the Sierra Center’s kitchens is either compostable or recyclable,” he said. The only exception would be plastic wrappers of industrially packed food, such as candy wrappers. 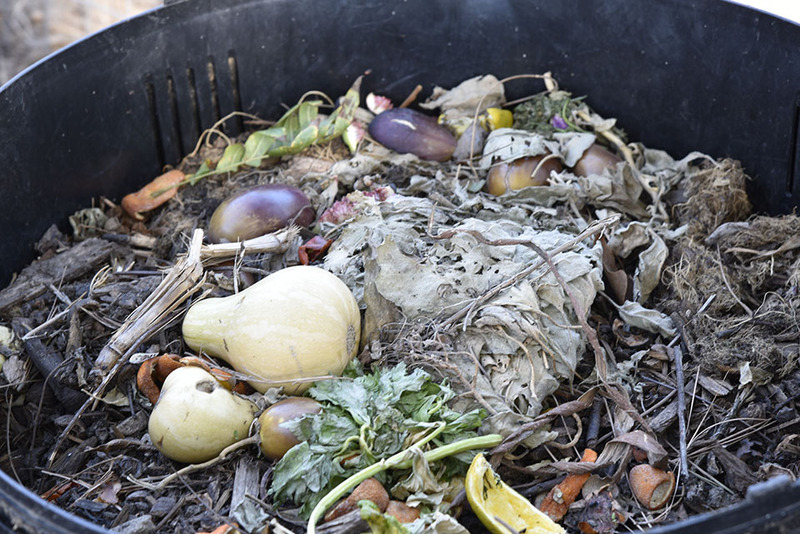 At the campus’ own composting site, operated by the Institute for Sustainability, pre-consumer food waste such as vegetable cuttings are turned into soil to be used in the campus gardens. “We have been pretty successful in sourcing products that can be recycled completely,” Killops said. The Sierra Center zero-waste project is scheduled to be completed by the beginning of the Spring 2018 semester. The installation of multiple trash cans grouped together as “source separation stations” is the key concept of the project. The bins will be arranged in groups of three, one container for each type of waste: landfill, recycling and organics. Pictures on each container will guide consumers on how to correctly drop trash. The intention is to make it as convenient and logical as possible, Killops said. To implement the project successfully, a change in culture on how to throw away trash will be needed, Killops said. The long-term goal is a unified program across campus. “At the moment, we’re evaluating our present resources, finding out what is needed and calculating costs,” Eriksson said. “We have to look at all the different entities on campus and track what type of waste they generate.” Campus entities included in the zero-waste plan are The University Corporation, Associated Students, University Student Union, Student Housing and Campus Operations. Reaching the final goal of zero waste is a challenge. “It’s more than just trash cans; it starts when a product is purchased to be used on campus,” Eriksson said. To track CSUN’s diversion rate, every single bin is weighed, tracked and sorted. “We’re working with the same waste hauler for the whole campus, allowing us to learn about our consumption easily,” Eriksson said. “So far, the changes implemented have tripled CSUN’s diversion rate, which is now around 59 percent.